“Chicks dig the long ball” Mark McGwire taught us. True that BigMac. But you know what chicks also dig?? Honesty. Major League Baseball sent out a message to the world today: Play the game with the utmost integrity or there will be severe repercussions handed down. 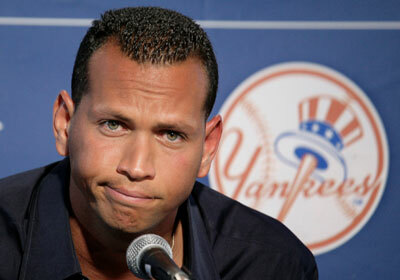 And that’s just what MLB did as they suspended 13 players, including Yankees controversial slugger Alex Rodriguez. While most of the suspensions were clearly justified, many felt that Rodriguez’s 211 game ban was a little too harsh. WHAT?! Too Harsh?? You gotta be kidding me! Rodriguez, currently the most disgraced figure in professional sports, has been linked to PEDs not once, not twice, not three (in my Lebron tone) but several times. You’re not fooling anyone Mr. Rodriguez. But there’s no need to worry because you have plenty of company. In fact some of the most prolific home run hitters in the last 10+ years are right on that PED list with you. Players will cheat just to have an extra 10-20 home runs in a season. But why do players compromise their honesty for some extra power? Players’ desires to get lucrative contracts, break records, and become legendary have led to this ePEDemic of players cheating in the game. I don’t think that it’s coincidental that the majority of players linked to PEDs are power hitters. After all, where are they getting all that “power” from? You don’t go to bed one night as normal human and wake up the next morning as Shrek. (Yes I’m talking about you Mr. Bonds). I understand that every athlete wants to achieve greatness; but what good does it do if you gain the accolades, but lose your integrity in the process. Well if chicks dig the long ball, does anyone dig the short ball? Maybe Ichiro can get back to us on that. But lets be real, baseball fans are fascinated with the home run. It is the single most exciting play in baseball. Not to mention, the most popular. Fans celebrate the home run because it’s an amazing feat to watch. Last I checked, there’s a home run derby during All-Star weekend. Not a triple derby or double derby, etc. So we understand the desire that players have to hit home runs. Let’s face it, power is attractive. “Home run hitters drive Cadillacs, and singles hitters drive Fords.” Wonderfully stated by Mr Ralph Kiner. There’s a lot of truth to that statement. The majority of prolific home run hitters are among the highest paid players on their team. So not only is the home run a fan favorite, but it’s also a favorite when getting a high salary. Of the top 5 highest contracts ever signed in baseball you have A-Rod (twice), Albert Pujols, Prince Fielder, and Joey Votto. I wonder what they all have in common? It’s a sad day in baseball when someone can’t hit 50 home runs in a season without being suspected for PED use. I’m already hearing suspicions about baseball’s most captivating rookie, Yasiel Puig. But then again this was the bed MLB made for itself. Whether they were aware of past usage or tried playing cover up, one thing is for sure; they are no longer condoning this type of behavior in the league. I applaud Major League Baseball for their stiff penalties. Let’s get baseball back to not only America’s favorite pastime, but America’s most Trustworthy Pastime.